Last weekend, we took a big picture view of the world by putting into a very simple perspective: "yield on vs. yield off." It showed that we are currently in an environment which is a "rush for yield," where assets also known as risk assets have been bid up and bought with fury as investors around the world look for some sort of income to add to their portfolio. 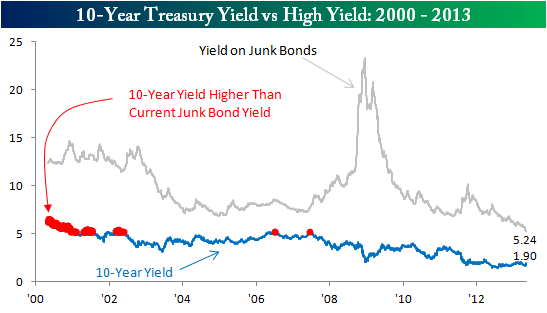 This has created an environment where junk bonds are now yielding the same price as risk free bonds were only a few years ago. While this is occurring in many of the developed countries, the following shows the current mania in United States junk bonds as yields continue to plunge to record lows (creating record high prices for the bonds). I mentioned last week that while people spend all their time, attention, and capital focused on finding the best possible risk assets to add to their portfolio, I would prefer to spend my time where no one is looking: assets that yield close to nothing. This is the world of cash or currencies. This weekend, I'll take it a step further and show how I monitor specific opportunities within the global world of cash, while we wait for this current "reach for yield" mania to subside. I will discuss "shopping list" cash options I believe have fundamental strength, and specific currencies I believe have fundamental weakness. I will, of course, not spend my entire life investing in non-yielding assets. The pendulum will switch direction at some point in the future and the herd, crowd, or whatever you like to them, will coming rushing out of these higher yielding assets as their value bursts. We'll now move deeper into where that conversation left off, and we'll find that the world of cash is not all that boring, especially when you are the only one at the party.